Relay sockets are components of a circuit that can be mounted with a relay. They provide the electrical interface between the relay itself and the circuit. A relay is essentially a switch that is electrically rather than mechanically operated, and is often powered by an electromagnet. The relay plugs into the socket's female terminal, and the socket is wired to the broader circuit. What are relay sockets used for? Relay sockets are used when you want relays to be easily mounted and replaced within a circuit. They make this process much simpler than if the relay was connected directly to the power source. Relay sockets differ according to the type of relay they are being used with. Different types of relay include latching and non-latching relays, general purpose relays and solid-state relays. 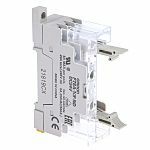 There are also different methods of mounting relay sockets, including panel mounts and flange mounts, and the method of mounting affects the design of the relay socket you need.